Even though RVs were not invented during Biblical times, it would be easy to believe that Psalm 23:4 was created by an unsuspecting wife on her way through Death Valley in a large RV. I suggested to Storm that we skip Death Valley National Park in the RV on our way to California and take the interstate instead (the GPS agreed with me for once). I reasoned that we could always visit this National Park later in our car when we were back in the area. 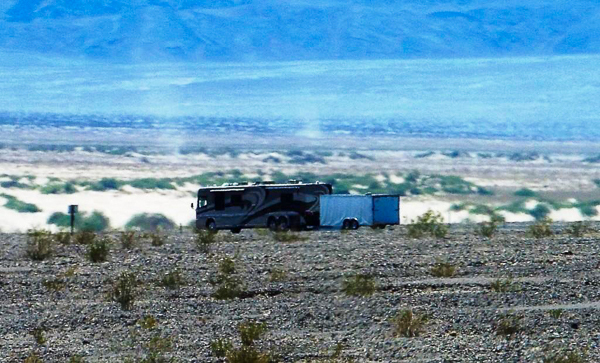 In spite of expressing his concern that our diesel pusher RV with a side mounted radiator would probably not do well in the Death Valley heat, when the time came to head west off we went through the Valley. Sure it was fine while the road was flat but once we started uphill, so did the temp gauge on the coach. Just inside the park – before it got hot and exciting! Whether due to my praying or Storm’s skill (or a combination of both), we made it safely out of the Valley with no equipment damage. Not many pictures from this ride as I had my face covered most of the time. 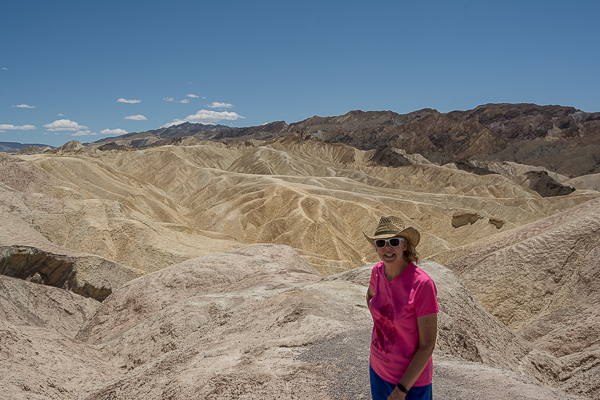 Terrie who rode in their pickup (so no smoking brakes – though their engine also got pretty warm) told me that she thought the whites, browns and pinks of the desert looked just like ice cream sundaes and cupcakes. Funny I thought it looked like a desolate, dry, hot place to be stranded in an RV with the wheels on fire and the engine overheating. 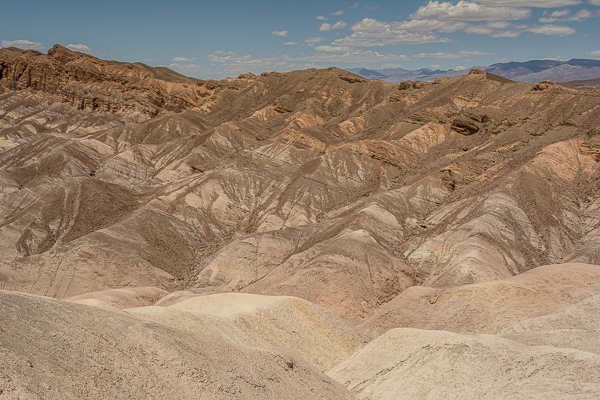 Cupcakes or disaster – what do you see in the desert? You absolutely did the right thing – there are actually signs in Death Valley warning that vehicles will overheat on the road going west. We have agreed to take 395 south through Lone Pine when we leave and from all that I have read and heard from folks like you we should have an excellent, scenic ride going that way! I’m glad I went on the road before you; otherwise, based on your experience to date, I would have been much too scared to have undertaken such a dangerous lifestyle. Perhaps, you should consider alligator wrestling or chainsaw juggling as a less stressful avocation. Actually only the oil temperature on the pickup got above normal, but not overheated at all. We thought the ride through Death Valley was very scenic and for some reason Terrie got really hungry. Sorry I forgot the details of your conversation with Storm – thanks for clearing that up! I know what you mean, Sandy – it is hard to imagine the perseverance required to make it through this rugged land on a horse or in a wagon.